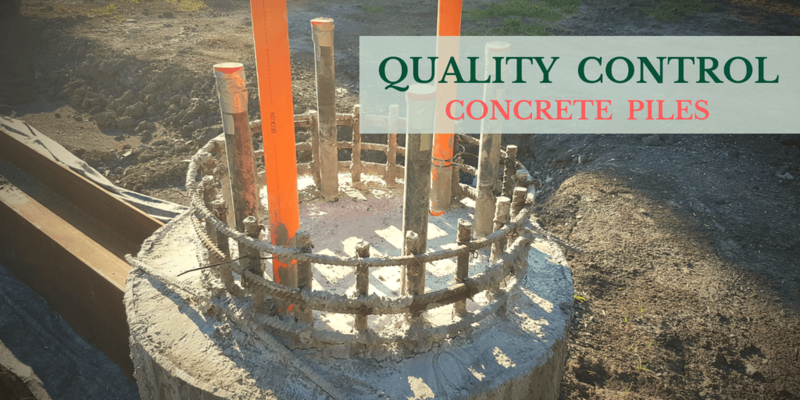 Quality control of concrete piles is a challenging task. Engineers, and contractors rely on experience and well-established procedures and test standards to verify the strength, and consistency of pile materials. Non-destructive testing help reveal potential defects that might have happened during pile casting (in the case of cast-in-place piles), or transportation and installation (in the case of precast piles). Construction and installation of concrete piles might lead to defects in concrete pile. These defects can affect the durability performance of the pile, as well as mechanical properties, such as load bearing capacity. Poor patches of concrete, and honeycombed concrete can affect the durability and strength of concrete piles. Moreover, inconsistencies in pile cross-sectional shape (necking, bulging) are among integrity problems of concrete piles. Cracks, and discontinuities that might happen during installation can also affect the strength, and capacity of piles. The following article describes some of the most common integrity issues in pile construction and installation. Low strain impact integrity testing can be used to assess the integrity and consistency of piles. The test works best on relatively long piles, driven piles, augeured piles, or drilled shafts. A hand-held hammer is used to impact the pile head. A Motion transducer is placed over the pile head and records the reflected echoes from the pile. The acceleration/velocity data are analyzed to identify potential defects in the pile. Pile integrity testing is standardized as ASTM D5882. Applications: The test results can be used to evaluate pile cross-sectional area and length; determining the integrity and continuity of piles; and assess the consistency of pile materials. Limitations: The test does not provide any information on the load bearing capacity of piles. The test cannot be conducted over pile caps. and the test should be done by a competent engineer/technician. Applications: Cross Hole testing can be used to determine the location of defects, as well as identifying the extent of the defects. The test can be done on larger diameter piles. Limitations: Requires installation of tubes during pile construction. Data recording and analysis might be expensive. Access to the tip of the wall is needed for most applications. Parallel Seismic method is mostly developed for integrity evaluation and quality control of concrete piles in existing structures, as the superstructure has been built upon the foundation. For integrity evaluation, a borehole is drilled close and parallel to the pile. Boreholes are lined with a plastic tube and filled by water for coupling between transducer and surrounding surface. An acoustic wave receiver is placed at the bottom of tube, moving upward with a constant speed. The pile-cap is struck by a hand-held hammer. The signals from the receiver probe and the depth-measuring device are recorded and analyzed the form of an acoustic wave profile. The profile is then used to evaluate the integrity of piles. The test method has been described in the ACI 228.2R document. Applications: The test provides a practical solution in quality control of concrete piles when pile head is not accessible. Limitations: Apart from being considered a more expensive NDT procedure, the test procedure requires drilling bore holes next to existing pile. This is not always possible in the vicinity of existing structure. This entry was posted in NDT, Piles and Foundations and tagged Concrete Pile. Bookmark the permalink. Useful article. Provides educative notes on quality control tests on concrete piles.